Each year, people around the world celebrate Earth Day to help promote and advocate for a cleaner, safer, and healthier planet. But even though it’s a global event, it is the decisions we make as individuals and communities (and not just on Earth Day!) that have the greatest impact. That’s why we are so proud of these Women Owned businesses, who are helping us reduce our collective environmental footprint in a variety of ways, from saving trees to reducing plastic waste. This Earth Day, make a commitment to “go green” and #BuyWomenOwned by supporting these innovative, eco-friendly Women Owned businesses. Did you know that every year more than 300 million pounds of single-use plastic dry cleaning bags are dumped in landfills? Green Garmento is working to reverse that trend by introducing recyclable, breathable, and reusable garment bags. Bonus – they are also pretty stylish. See founder Jenni Nigrosh’s pitch on Shark Tank. More than 900 million trees are harvested every year – and that’s just for paper products. But it’s hard to get around the demand for the convenience of paper plates, napkins, and tissues. Enter Terry Lehmann and her company True Green Enterprises’ Green2 Tree Free Paper, a sustainable and eco-friendly alternative to paper made from sugar cane husk and quick growing bamboo grass. They offer a variety of paper products for households and businesses, from copy paper to bathroom tissue. As both a lifetime environmentalist and mother of four, Lunchskins founder Kirsten Quigley knows a thing or two about finding the right balance between making a difference and getting your kids out the door each morning. She founded Lunchskins with a mission to eliminate single-use plastic pollution by providing easy-to-use, functionable alternatives to plastic bags. Since 2008, they’ve helped countless families and communities think and act greener by replacing more than one billion plastic bags with Lunchskins products. Tanya Lewis was so dismayed by the waste (and expense!) of disposable mop systems that she decided to make her own – a quality, reusable mop pad using microfiber to clean and chamois to absorb. The Green Glider mop pads even fit on all the top selling mop systems, making it easy to make the eco-friendly switch from disposable to reusable. Rebel Green founders Ali Florsheim and Melina Marcus have sought out to prove that living an eco-friendly lifestyle doesn’t need to be boring. 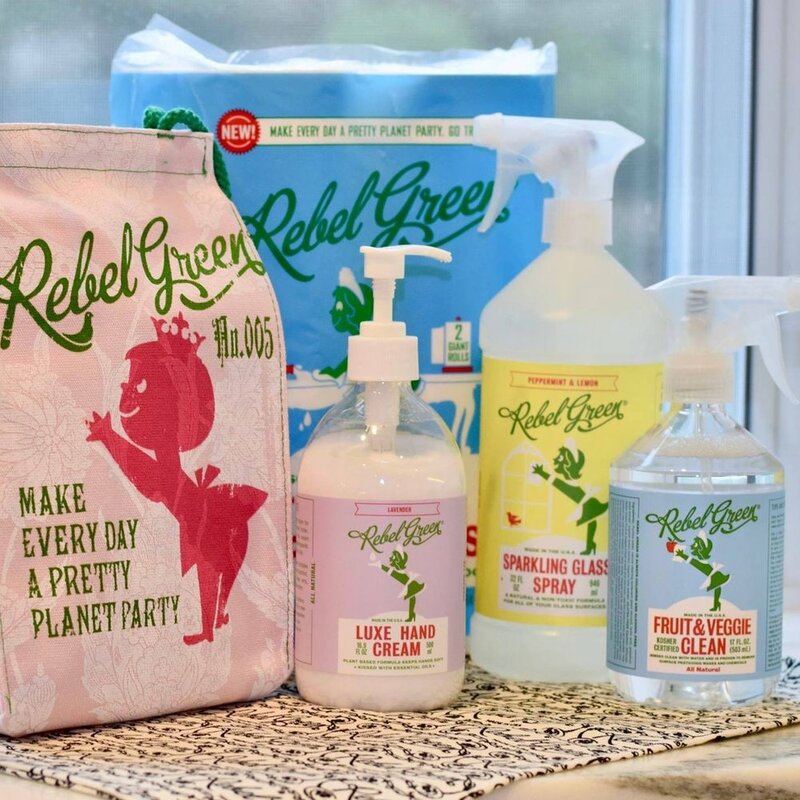 Their line of effective, natural cleaning products come in packaging that is chic, a bit edgy, and a lot of fun. Still, their mission is no fun and games – they produce plant-powered cleaning products that are safer for your family and gentler on the environment. The company also donates a portion of sales to clean air, clean water, and clean food initiatives. Traditional plastic, which is made using petroleum, makes up 8 percent of all oil consumed worldwide, and 15 percent of all solid waste in landfills. To top it off, it also can take up to 1,000 years for plastic to fully decompose. To reverse that trend, Virginia P’an, founder and CEO of Yumi Eco Solutions, is seeking to replace petroleum-based plastic products with products made from sustainable bio-materials, such as bamboo and natural starches. In fun colors and designs, Yumi sells a variety of kitchen and office products, from bamboo nesting bowls to compostable plates. After starting a personal journey to lead a more sustainable lifestyle, EcoPlum founder Gia Machlin realized her knowledge and resources could help others, as well. She founded EcoPlum Boutique to provide stylish clothing and accessories that are also sustainable, fair trade, organic, vegan, upcycled, recycled, and/or ethically source. The best part? Shoppers can earn rewards points that can either be used on discounts on future purchases or donations to environmental causes. Newer PostThe Van Cleve Seafood Co.